World Diabetes Day Conference 2017 | Life, Sport and Diabetes - An everyday look at my life with type 1 diabetes. 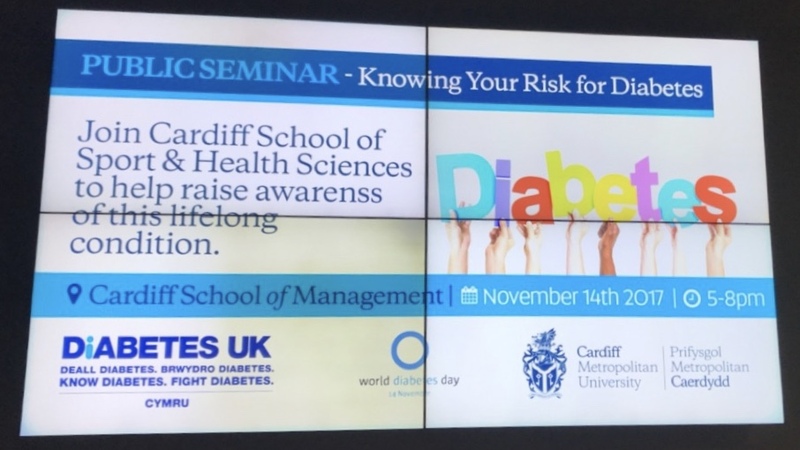 This evening I attended an event with a twist, for World Diabetes Day at Cardiff Metropolitan University. What was particularly great about the event was that it was all organised by students from the Health Sciences school, who worked incredibly hard to put on the conference and exhibitions. What was particularly innovative, or refreshing about the event, was that all of the exhibitors were either directly or indirectly linked with diabetes. Which gave a really rounded view of the possible healthcare implications of the condition from exhibits on retinopathy screening, to podiatry and heart health checks. The conference part of the evening included talks from leading healthcare professionals within the university, the Cardiff healthcare community and diabetes charities. The talks were very well rounded and again, covered a number of areas related to diabetes such as carbohydrate counting and nutrition and the psychology behind trying to adopt behaviour change with diabetes. As the event was held on World Diabetes Day, it was lovely to spend the event with some of my friends with diabetes and finish the day having dinner with diabuddies. We'd all had diabetes over 15 years and it was lovely to reminisce together about diabetes treatments have evolved over that time. Which is a big part of what World Diabetes Day is about for me, looking back at how far we've come thanks to Drs Banting and Best and celebrating the good fortune of gaining new friends in the same boat with the condition!